UPDATE, 10/29/18: Per my item below, in an 8/24/18 e-mail, Olean, NY fireman/Dechoker vendor Timothy Hite claimed he had an 8/30/18 meeting scheduled with NY State Sen. Catharine Young & Assemblyman Joseph Giglio "to start writing legislation to make it mandatory for all eatery areas to have a Dechoker (anti-choking plunger device), kind of like NY did for first aid and CPR." In response to my inquiries, today Sen. Young's spokesman John Eberth left me a voice message and Assemblyman Giglio sent me an e-mail. Both confirmed the meeting took place but that no legislation is pending. (Tim) Hite, a professional firefighter, now promotes the Dechoker life-saving medical device which is used to suction objects from the airways of toddlers, children and adults. Recently, Hite sold several sets of the Dechokers to the Allegany-Limestone Central School District, the first school district in the state to purchase the items. Middle-High School Principal Cory Pecorella said the school district purchased two packages of the suction devices for each of the campuses. Each package contains three Dechokers in adult, youth and toddler sizes. The packages will be kept in the nurse’s office and the cafeteria. ...Pecorella said he learned of the device from Hite, whom he serves with in the Allegany Volunteer Fire Department. Pecorella sad he or Hite will train the faculty and staff how to use the items. Along with some other quick questions I sent yesterday, per these e-mails I obtained via a public records request, I asked principal Pecorella if he'd received any commissions selling the Dechoker. I also asked whether he'd seen any of these media reports about the Dechoker, published months before he arranged purchase of the devices. Can New Devices Match Heimlich to Stop Choking? LifeVac and Dechoker pose alternative to abdominal thrusts -- LifeVac and Dechoker pose alternative to abdominal thrusts by Laura Johannes, Wall Street Journal, July 11, 2016. Anti-choking device business raided, accused of investment scheme by investigative reporter Matthew Grant, FOX46-TV News, Charlotte, NC, March 12, 2018. 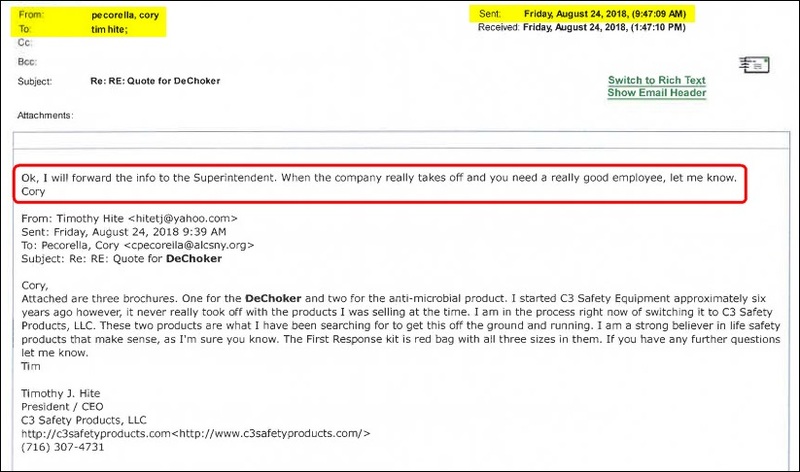 'Dechoker' anti-choking device claims to save lives but has never been tested on humans by Jackie Callaway, WFTS-TV News, Tampa, FL, May 21, 2018. Heimlich alternative? KWWL investigates new medical device offered to Iowa school by Amanda Gilbert, KWWL-TV News, Waterloo, IA, May 31, 2018; click here for the video. Tim Hite remembers a time when he tried to help a man who was choking on a sandwich, but couldn’t save him...During one incident in his hometown of Camden, he and other emergency personnel couldn’t help an older individual who was choking. The man, who was disabled, had tried to eat two peanut butter sandwiches at once, causing him to choke. By the time we got to him, he was already in cardiac arrest” and died, he lamented. Yesterday I sent some quick questions to Mr. Hite asking for more details about the choking death and the placement of the Dechoker in the Sheriff's dispatch office. Per Mr. Hite's August 24 e-mail (copied above) I'm also curious about his meeting with New York State Senator Catharine Young and New York State Assemblyman Joseph Giglio, so I'll inquire about that. I'll report the results of my inquiries in a future item. 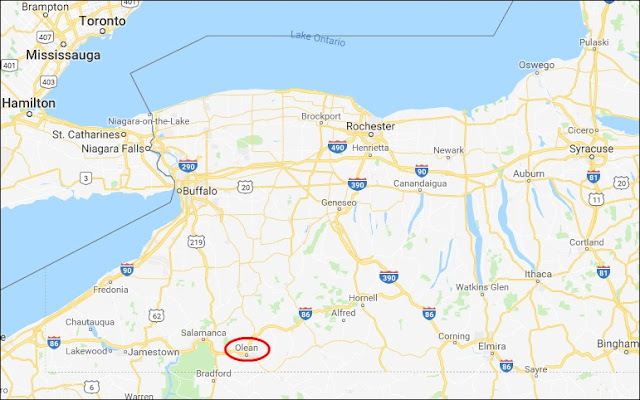 * My original headline began "Olean, NY school principal..." H/T to a knowledgeable reader who informed me "Allegany-Limestone Central Schools are not Olean schools. The two districts abut each other, but are separate," so I changed to "Olean, NY-area."